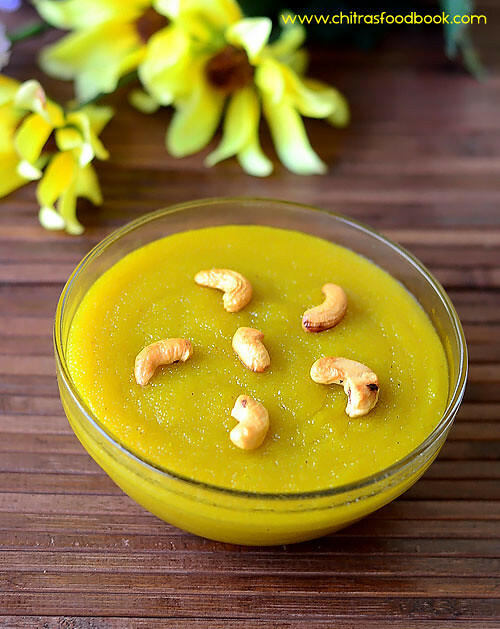 This is an easy and quick version of moong dal halwa / moong dal sheera. I followed this recipe from Tarla Dalal’s website. Usually moong dal halwa takes more time to cook. But this is a quick recipe that can be prepared under 30 minutes. 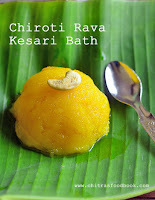 As it is prepared without khoya, I tried it immediately. It came out very well. I have tasted moong dal halwa in many North Indian Lunch buffet. I love its coarse texture and softness. When I prepared this recipe, I was very happy that I could make a similar one at home easily. 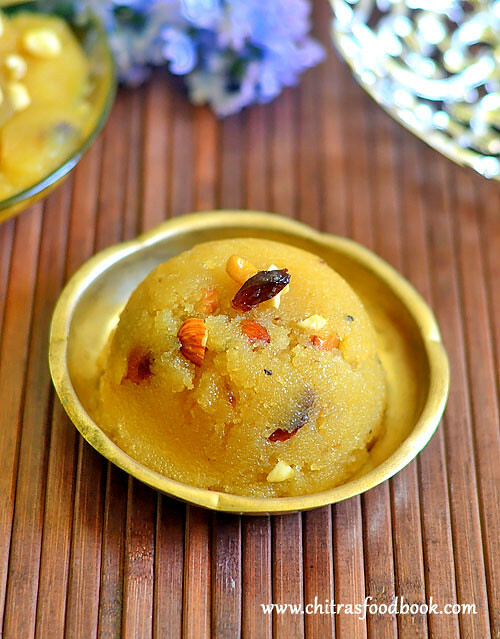 Friends, do try this quick moong dal halwa recipe without khoya. You will love it for sure. I took a video for this recipe. I will try to add it tomorrow. Now lets check out the recipe with step by step pictures. Do check out my easy atta halwa / wheat flour halwa, Corn flour halwa/ Karachi halwa, Badam halwa, easy beetroot halwa ! I have a happy news to share with you all. 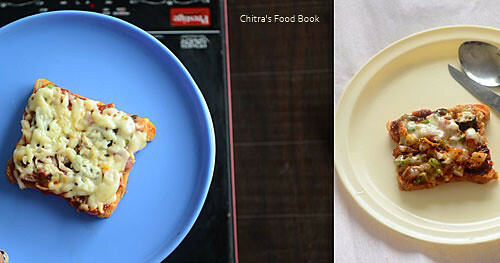 Chitra’s Food Book has been selected under Top 100 Vegetarian Blogs in feedspot. Thank you Anuj ! Wash and soak moong dal in hot water for 2 hours. Drain the water completely and dry grind the dal to a paste without adding water. Strain the ground paste through a thin cloth. Squeeze the water content. Heat ghee in a kadai. Add ground paste and saute in medium flame till it becomes golden brown. Add milk + Water and cook till thick. Add sugar, mix well. Cover and Cook for 5 minutes in low flame. Mix well.Add cardamom powder, saffron. When the halwa starts to leave the sides of pan, remove and garnish with nuts. Serve warm. Wash and soak moong dal in hot water for 2 to 3 hours.Drain the water completely. Grind to a slightly coarse paste without adding water.Set aside. Chop the nuts finely. Soak saffron in 1 tbsp warm water.Keep aside. Take a thin cloth and put the ground paste.Squeeze it well and remove the water content. Now the paste looks dry without moisture. Heat ghee in a kadai. Keep the flame low and add the paste. Mix well till it spreads well with ghee. Cook in medium flame for 12 to 15 minutes till it becomes golden brown and crumbly. Add milk and water. Mix well till 3/4 th of the milk + water is absorbed by the moong dal paste. After it becomes slightly thick, add sugar and mix well. Mixture becomes a semi liquid. Cover and cook in very low flame for 5 minutes. Open and mix well. When it starts to leave the sides of pan, add cardamom powder. saffron thread soaked in little water ( soak 1/2 tsp saffron in 1 tbsp water).Mix well. 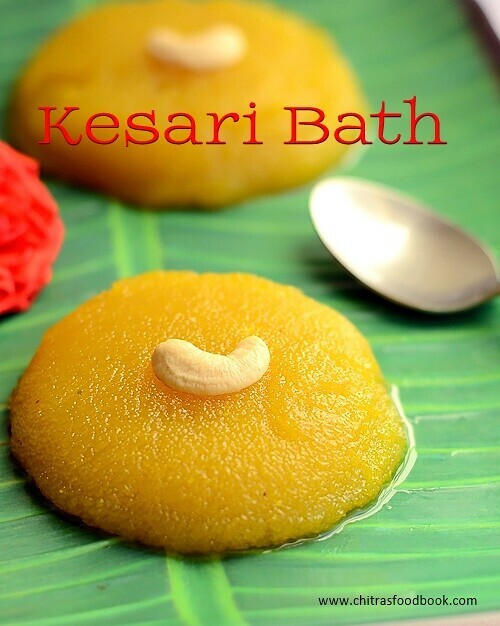 Halwa becomes thick and starts to leave the sides of kadai with traces of ghee, switch off the flame. No need to wait for the ghee to release. If you stir more, halwa becomes hard after cool down. 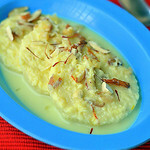 Remove the halwa in a bowl and garnish with chopped nuts. When the halwa becomes warm, it becomes non-sticky and well set. Enjoy when warm for best taste. 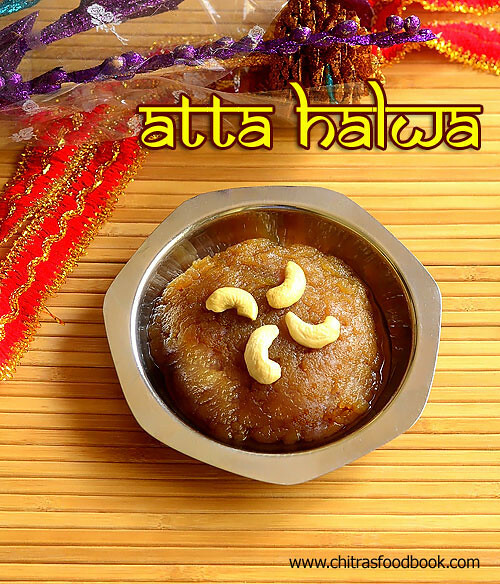 You can store this halwa upto 3 days in refrigerator. 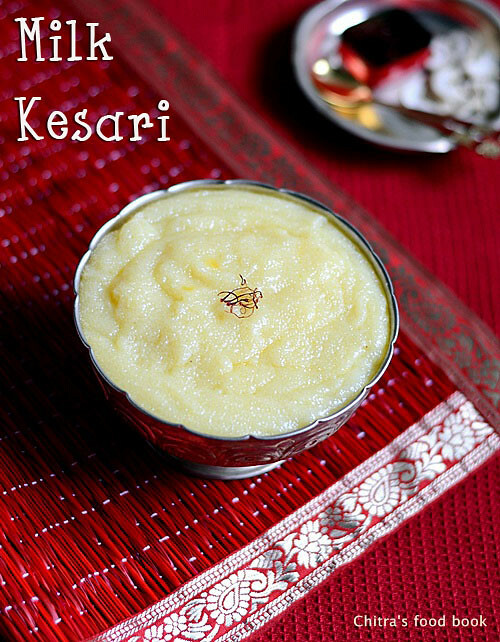 You can reheat it in a kadai , microwave or dosa tawa adding 1 tsp ghee to serve it fresh everytime. You can skip milk and use water completely. Do not reduce the quantity of ghee. Halwa becomes hard. Do not cook the halwa for more time after adding sugar. Sugar caramelizes and hardens the halwa. Remove the halwa as soon as it starts to leave the sides of pan. Straining the ground moong dal paste in cloth helps to remove the water content. Hence it cooks quickly. 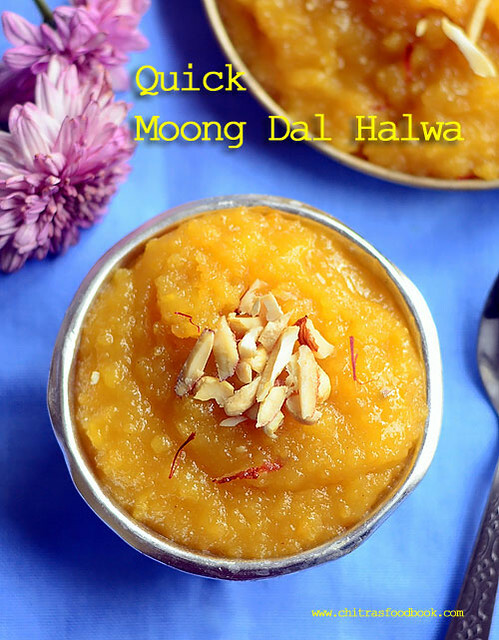 Try this easy, yummy Moong dal halwa and enjoy ! 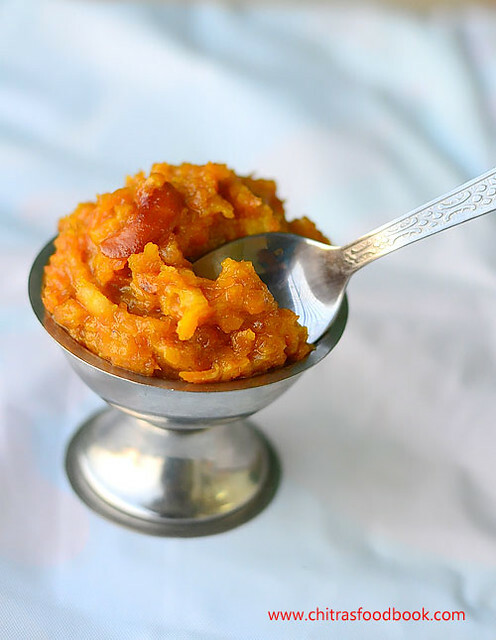 Yesterday I prepared carrot halwa with khoya in pressure cooker (Gajar Ka Halwa With Khoya) without using milk/condensed milk for the first time. I made it for my Thursday Guru Pooja prasad. It came out very well. As I made in pressure cooker, I made it very quickly and easily. Carrot halwa is my favorite dessert in restaurant. My Lunch buffet would be incomplete without tasting hot carrot halwa with a scoop of cold vanilla ice cream. Its a divine combo. 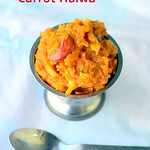 Long back I had shared carrot halwa (Gajar halwa in Hindi) recipe without khoya in pressure cooker. In that recipe, I used milk to cook carrot.But here I made it without milk as we are adding khoya in it. I used water instead of milk. So the color of my halwa came out bright in color.It tasted like the one we get in sweet shops and hotels. I was very happy with the results. 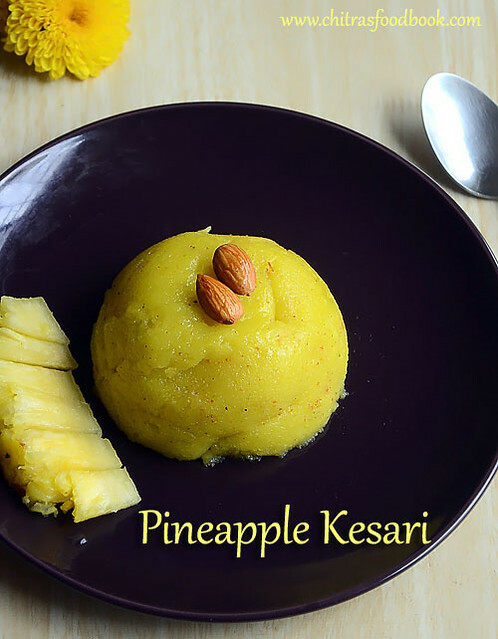 You too give this recipe a try and share your feedback with me. I have also shared some tips and variations in the method with step by step pictures section for better understanding. 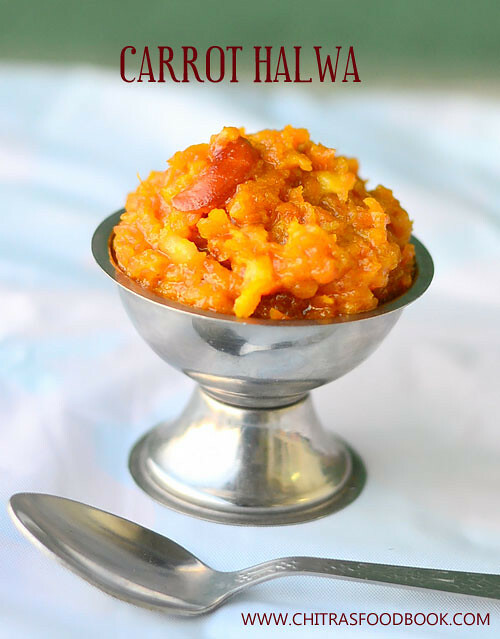 Hope beginners would try this carrot halwa recipe and make it easily. 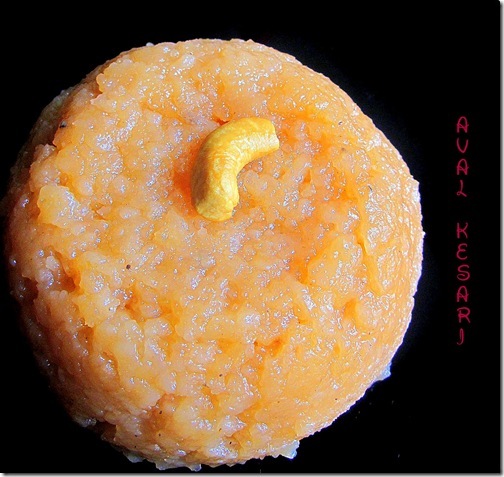 So, lets see how to make Carrot halwa/Gajar ka halwa with khoya in a pressure cooker. 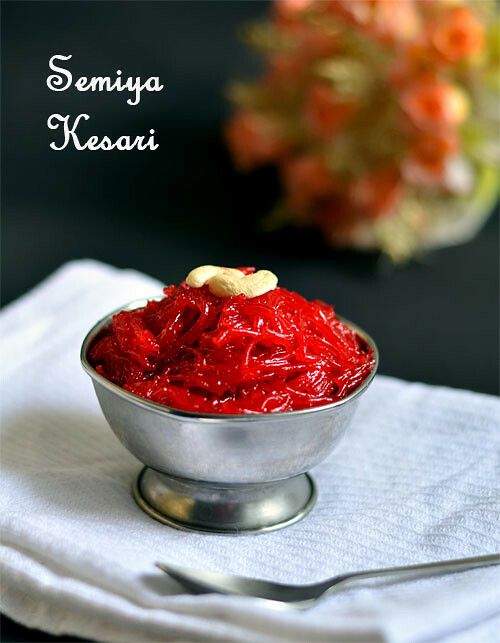 Also check out my easy beetroot halwa in a pressure cooker which is a super hit recipe in this website. 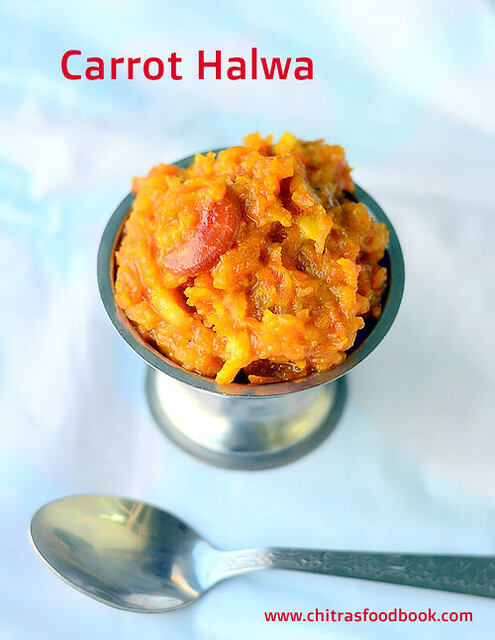 If you want make carrot halwa in a kadai instead of cooker, you can looks at THIS RECIPE. 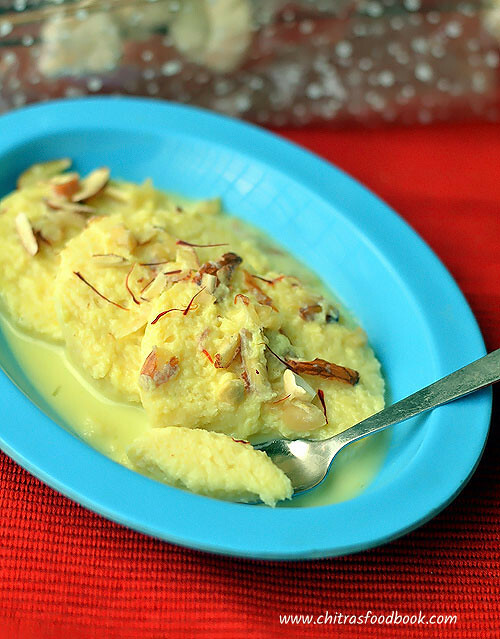 Crumble or grate khoya, set aside. Wash,peel skin and grate carrot in big holed grater. Heat ghee in pressure cooker base and roast cashews. Saute carrot till raw smell goes off. Add water and cook in high flame for 2 whistles. Carrot cook well and becomes soft. Add sugar and mix till halwa starts to leaves the sides. Add khoya,cardamom powder. Switch off the flame immediately. Mix well till Khoya combines with carrot. Remove and let it cool down. Halwa becomes non-sticky when it becomes warm. Serve warm & enjoy with ice cream. Grate or crumble khoya. Set aside. Wash and peel the skin of carrot. Grate it using a big holed grater. Keep it aside. Heat ghee in a pressure cooker base.Roast cashews till golden. Add grated carrot and saute well for 5 to 7 minutes in medium flame till raw smell vanishes completely. Carrot turns pale orange in color. If you don’t saute properly, halwa smells raw. Add water(If you want dark colored halwa) Or milk and pressure cook in high flame for 2 whistles. Remove the lid after steam is released completely. Carrot becomes soft and cook well. If you find any moisture content or water in the cooked carrot, saute well in high flame till it becomes dry. Add sugar and mix in medium flame.Sugar melts and halwa becomes watery. Keep mixing in medium flame till halwa starts to become slightly thick and leave the sides of cooker. Do not wait for it to become too thick. Lower the flame completely. Add cardamom powder, crumbled khoya. Mix well and Switch off the flame immediately. Mix till khoya spreads with carrot in off fire. Heat of the carrot is sufficient to partially melt & mix the khoya. No need to mix till khoya melts completely. Khoya should be visible here and there just like the ones served in hotels & sweet shops. Halwa may look sticky when its hot. But when it turns warm, it becomes non-sticky and comes to right texture. You can reheat in microwave oven for 1 minute in high power and serve hot if you like OR enjoy it warm with a scoop of vanilla ice cream. 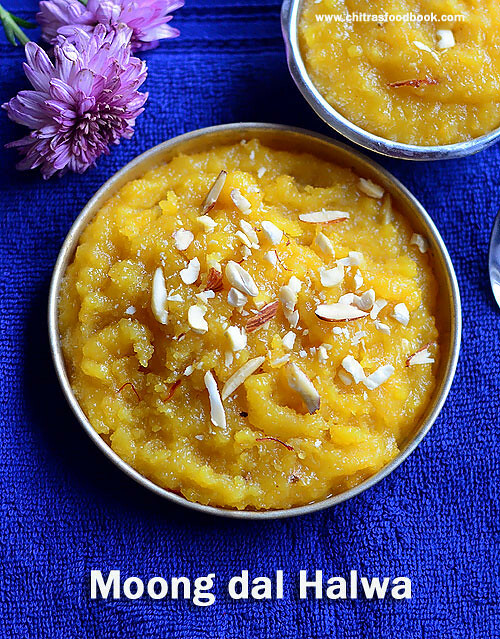 This halwa stays good for one day without refrigeration and up to 3 days with refrigeration. If you refrigerate the halwa, you can reheat it at the time of serving. If you want carrot to be visible in the halwa,you must use a grater with big sized holes. Carrot halwa smells raw if you don’t saute it well. By the time you saute, carrot gets half cooked. Pressure cooking helps carrot to cook quickly. I added little water to cook carrot as I wanted bright colored halwa. 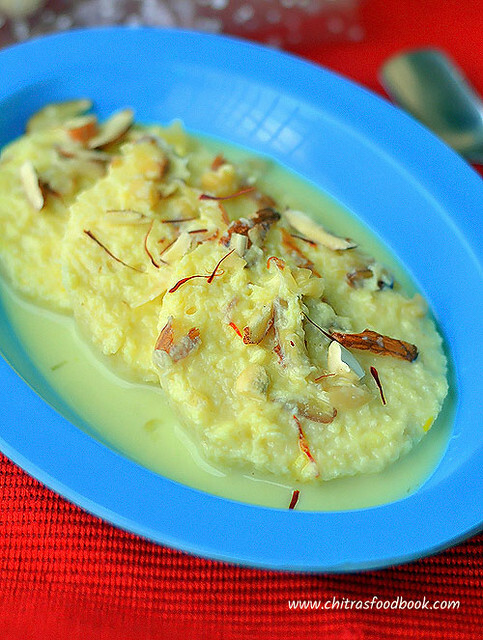 Adding milk makes the halwa pale orange in color. As we are adding khoya,there is no need to add milk for cooking carrot. But cooking in milk makes the halwa more rich. Do not add more khoya than the mentioned quantity. It makes the halwa sticky. Do not add less sugar. It makes the halwa smell raw. Do not stir the halwa for long time after adding sugar. Sugar caramelizes and halwa becomes chewy. 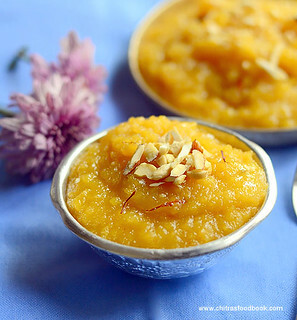 Try this easy, yummy Carrot halwa with khoya and enjoy with ice cream! Dry jamun recipe with MTR ready mix. Last year I made a detailed post on how to prepare gulab jamun with instant mix. Gulab jamun is considered to be the last minute sweet to me for diwali. As its preparation is very easy using readymade mix, I always make it one day before Diwali. This year I wanted to try dry jamun for a change. Dry jamoon is our family favorite sweet we buy from Adayar Anandha Bhavan. This year I bought ORKAY Gulab jamun mix in addition to MTR mix as well. It is also equally good but my choice is for MTR because of its softness . 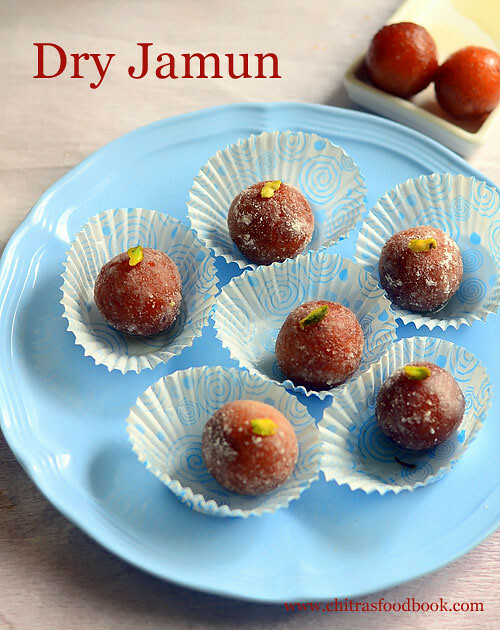 Dry jamun recipe is very similar to our basic gulab jamun recipe except the soaking time. Usually dry jamoon needs less soaking hours. Some people like to have gulab jamun without sugar syrup. For them , Dry gulab jamun is the ideal choice. It tastes mildly sweet but still juicy with all the syrup in it. Ok, lets see how to prepare dry gulab jamun using mtr mix with step by step recipe. I hope this recipe works for Gits, Aachi, GRB. Bambino and other brands too. 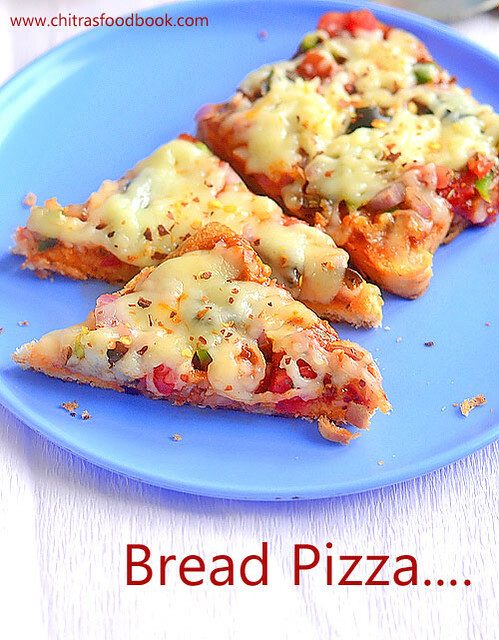 Vegetable Bread Pizza is an easy and quick breakfast and snack recipes for kids.It tastes good with or without cheese.Actually Bread pizza can be made in 3 ways.It can be made without oven ie. in dosa tawa ( Stove top) or it can be baked in convection oven or microwave if you have at home. 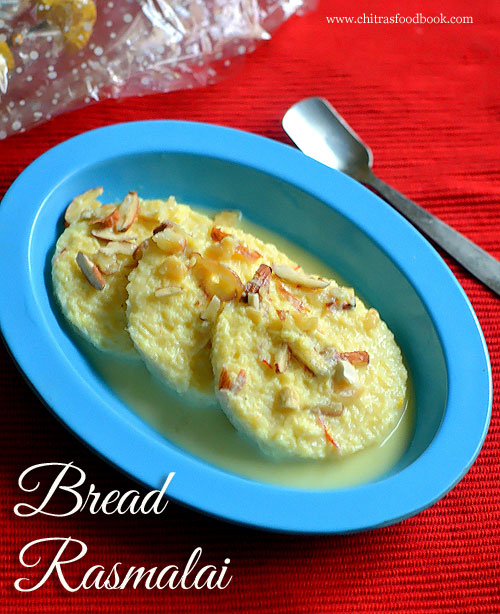 All are easy to make and tastes good in its own way.Its a great idea to use the leftover bread slices. I feel tawa and microwave options are easier as it takes less time to cook than baking in convection oven. But we should do it carefully as the chances of burning is more.This morning I prepared bread pizza recipe on stove top, oven and microwave just to make this post. I have shared all of the 3 methods below with a short video. Choose & try whichever is convenient to you . I have used store bought pizza sauce and pizza seasoning/ spice mix. You can make it just by using tomato ketchup & pepper powder. To make a pucca Indian version, sprinkle some garam masala powder or tandoori masala powder, marinated paneer cubes if you have in hand. You can top with lots of cheese for kids & without cheese if making for you & your husband ( If you are calorie conscious) .Adding grated mozzarella cheese is just for attracting kids because taste of this pizza comes from the sauce, mixed vegetables and spice mix.Just play around with your favorite veg and non-veg toppings and enjoy it. 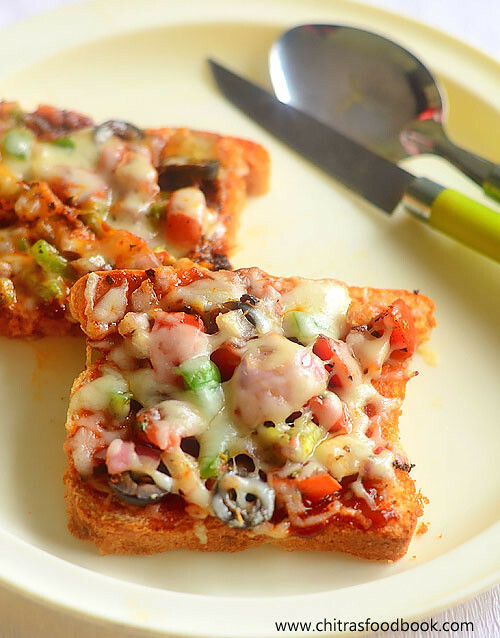 Now lets see how to make this easy and simple recipe for vegetable bread pizza without oven( on tawa), microwave and convection methods with step by step photos and video. To make bread pizza, wash and chop all the vegetables finely. Grate the cheese and keep aside.Take a bread slice and apply butter on both the sides.Keep in a plate. In a wide bowl, mix all the finely chopped vegetables, pepper powder, salt and pizza seasoning mix.Keep it ready. 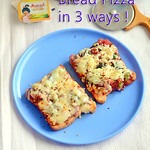 Take the bread slice and apply the pizza sauce on one side.Spread the mixed vegetables. Top with grated cheese. You can either cook them on tawa/pan, microwave or bake in convection oven. Bread pizza in tawa : Heat a dosa tawa and apply some butter. Keep the loaded bread slice.Cover cook in very low flame for 3-4 minutes or until the cheese melts.Remove in a plate and serve hot. Cover cook is very important. If you don’t cover cook, cheese won’t melt and bottom of bread slice may burn. Bread pizza in microwave : Place the bread slice in microwave and cook in high power( mine is 800w) for 1 minute or until cheese melts.If the power is less, it may take 1.5 to 2 minutes. If power is more, it can be done under 1 minute.So keep an eye. Bread pizza in convection oven : Preheat convection oven in 180c. Keep the bread pizza in a baking tray. Bake it for 5 minutes at 180c. Cheese melts and the sides of bread slice turns slightly crispy. Remove and enjoy ! The quantity of chilli flakes, pizza mix and pepper powder depends on our taste. You can add any number of toppings like paneer, mushroom, jalapeno, sweet corn etc..
Do not cook the pizza on open tawa, it takes long time for the cheese to melt. Microwave bread pizza takes very less time to cook.If you keep for more time, pizza would burn. 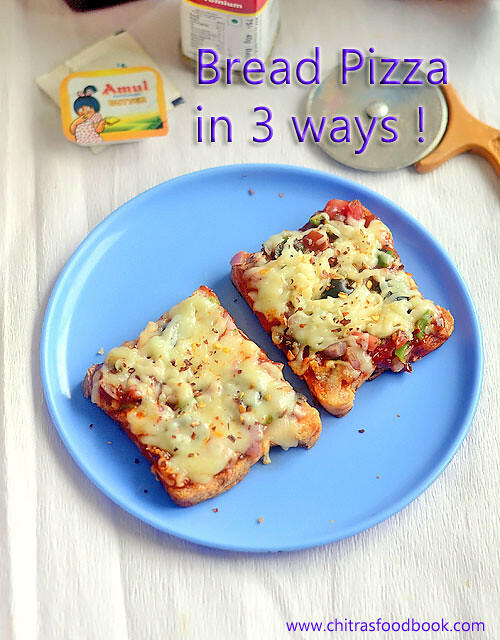 Enjoy this easy, yummy bread pizza at home ! Kids would love it for sure ! !